The technologically advanced powertrain of the 2016 Sonata Plug-in Hybrid Electric Vehicle (PHEV) was named to the prestigious Ward's 10 Best Engines list. This is the first time that a plug-in hybrid powertrain has made the list. "For Hyundai's first entry into the plug-in hybrid segment, Hyundai engineers did an impeccable job blending fuel efficiency with refinement and daily usability," said Drew Winter, editor-in-chief, WardsAuto World magazine. "Transitions between all-electric and hybrid modes are completely seamless, something that drivers will undoubtedly appreciate on long journeys, and the six-speed automatic transmission gives drivers a greater sense of connection, compared with other hybrids in the segment." The 2016 Sonata Plug-in Hybrid offers the efficiency of an alternative powertrain with a unique aerodynamic exterior design, best-in-class total interior volume, premium features and advanced safety technologies, all at an excellent value. The Sonata Plug-in Hybrid gives drivers the best of both worlds by providing the power delivery of a conventional gasoline engine, perfect for long trips, with the additional benefit of environmentally friendly all-electric range for commuting. The vehicle is powered by Hyundai's 2.0-liter Nu four-cylinder GDI engine, which produces 154 horsepower and 140 lb. ft. of torque. 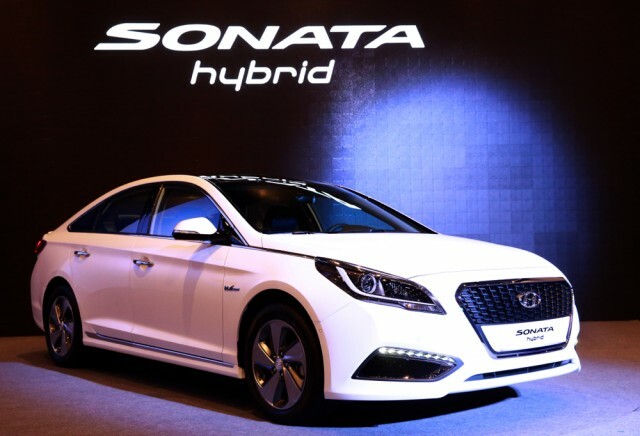 Unlike other hybrids in the segment, the Sonata Plug-in Hybrid utilizes a six-speed automatic transmission with a 50 kW electric motor in place of the standard torque converter. The powerful electric motor, coupled with the automatic transmission, gives drivers a heightened sense of connection over CVT transmissions common to the hybrid segment. Lastly, the vehicle's 9.8 kWh lithium polymer battery pack provides a best-in-segment all-electric range (AER) of 27 miles, so many consumers will be able to complete their daily commute without using a single drop of fuel. "Receiving this award demonstrates Hyundai's continued momentum as a leader in advanced powertrains," said Mike O'Brien, vice president, Corporate and Product Planning, Hyundai Motor America. "We see significant potential with the Sonata PHEV as being a 'best of both worlds' zero carbon solution and this award provides a recognized platform to highlight the technological and environmental leadership of the entire Sonata family." This is the 22nd year for Ward's 10 Best Engines, a competition created to recognize outstanding powertrain achievement, world-class technologies and those rare engines or electric propulsion systems that are so compelling that they help sell the vehicle. To be eligible, a new or significantly improved engine or propulsion system must be on sale in a production vehicle during the first quarter of 2016, with a base price capped at $61,000. Ward's 10 Best Engines is the ultimate list that defines the industry's outstanding powertrains. Since the list began in 1995, Hyundai has been honored five times: the Tau V-8 was in 2009 (4.6-liter), 2010 (4.6-liter) and 2011 (5.0-liter); the Gamma I-4 in 2012; and the hydrogen fuel cell powertrain in 2015. The 2016 awards ceremony will take place at a banquet during the North American International Auto Show on January 13, 2016, in Detroit.